Jump Start Your Dazzling Fall Garden With Just 1 Simple Plant - Jamie & Co. Imagine the impact of a pot of brightly blooming flowers set on your doorstep. The eye is immediately drawn to the color, skimming over other areas of the porch, perhaps not noticing details like peeling paint or steps in need of a sweep. 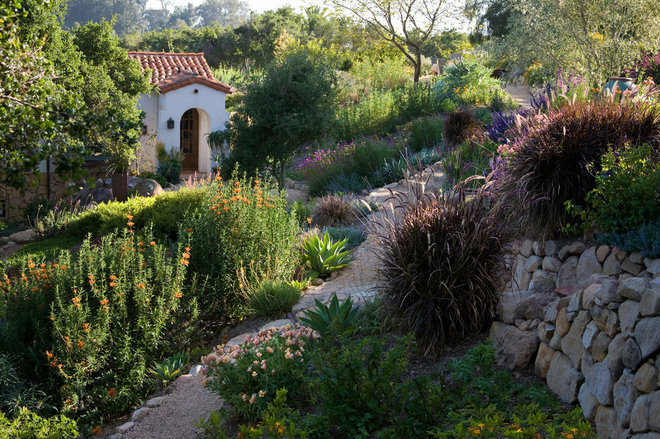 In the same way, adding just one colorful perennial or a shimmering ornamental grass can rejuvenate tired, end of season borders. 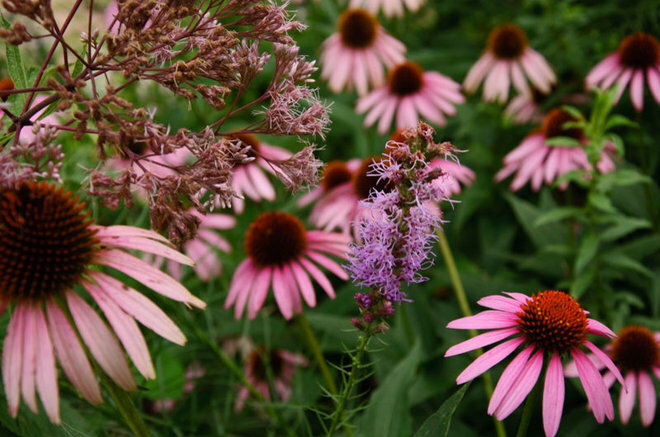 Give them a boost with one of these high-impact plants that cross over from summer to fall. 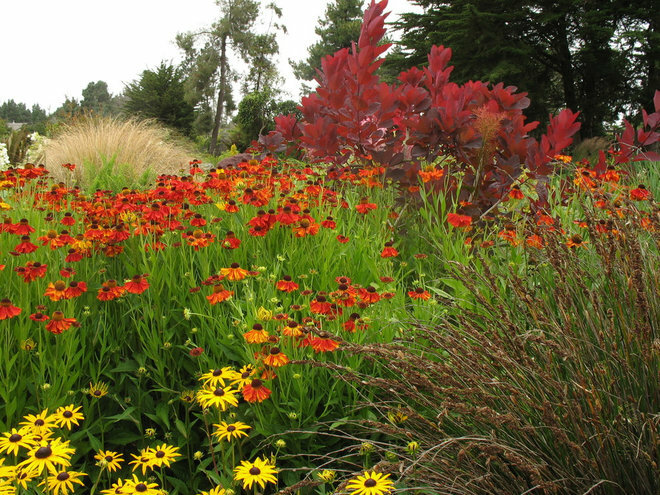 Take a look at how planting a single fall favorite, such as gold-petaled black-eyed Susan or purple fountain grass, can gracefully transition beds from summer to fall. This easy-care plant is a popular choice for fall gardens, with good reason. Its standout blooms come into their own in September, turning from pale green to rosy pink and then to deep pomegranate, just as many other summer flowers are beginning to fade. Sticking just one of these clumping perennials into a garden bed will immediately draw the eye and the attention of butterflies and other pollinators. 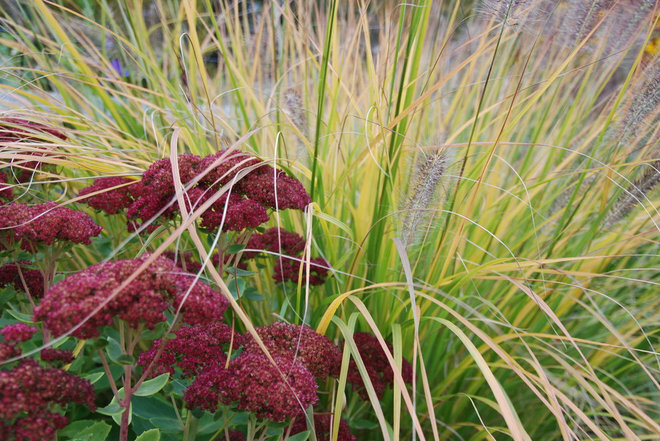 Pair it with: Ornamental grasses and fine-leaved perennials, such as artemisia or thyme. The contrast in textures between stonecrop’s succulent leaves and chunky flowers and feathery grasses or small-leaved plants makes for a standout combination. (Rudbeckia hirta)The cheerful golden-petaled and dark-centered blooms of black-eyed Susan, also called gloriosa daisy, enliven late-summer and fall borders. The plants, native to prairies of the central United States, are much beloved by butterflies. Cultivars may be available at your local nursery, producing flowers in shades of red, bronze and orange and with bicolored petals. 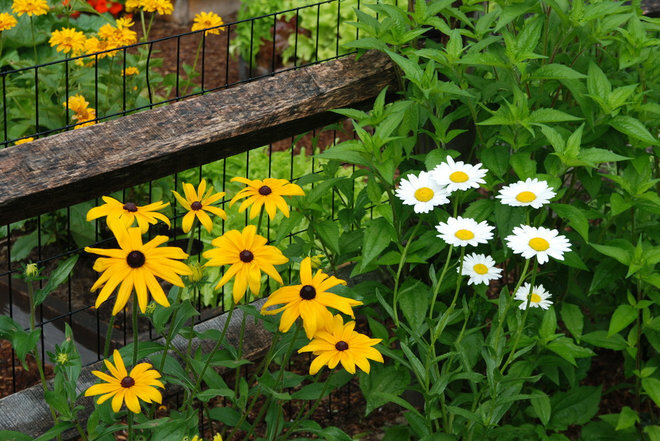 Pair it with: For a fall bouquet garden, pair black-eyed Susan with other late-summer blooms that work well as cut flowers, such as shasta daisy (Leucanthemum x superbum; shown here with black-eyed Susan), annual sunflowers, chrysanthemums and coneflowers (Echinacea spp.). (Helenium spp. )Look past the unattractive common name for what is a gorgeous late-summer bloomer. Flowers bloom from August to October, with petals in yellow, orange, red and striped variations that grow from the center like rays of the sun.The plants grow in clumps that can mature to be about 3 to 5 feet tall and 2 to 3 feet wide. 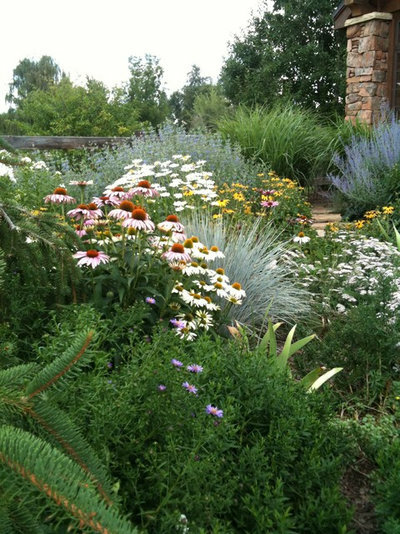 To refresh borders this season, remove tired-looking summer annuals and fill in the gaps with budding sneezeweed. 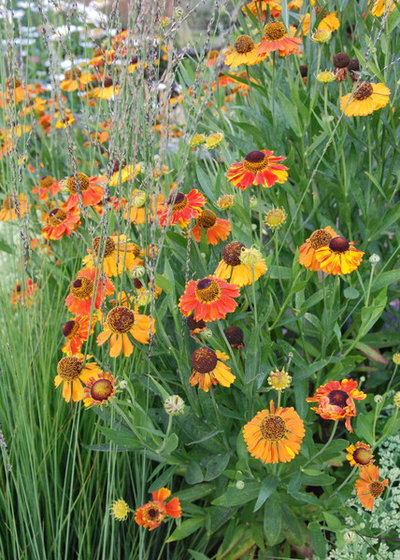 Pair it with: The chocolate centers of sneezeweed flowers play well with plants that have brown or deep bronze hues. In this border, sneezeweed is combined with the brown seed heads of a rush (Juncus sp. ), purple-bronze leaves of ‘Grace’ smoke tree (Cotinus ‘Grace’) and dark-centered black-eyed Susans to make a stunning quartet. Purple fountain grass and lion’s ear (Leonotis leonurus) line a Southern California pathway. (Pennisetum setaceum ‘Rubrum’)The grande dame of ornamental grasses, purple fountain grass can grow up to 4 feet tall and 2 feet wide in a single season, with arching purple leaves and fuzzy, caterpillar-like seed heads. The commonly available ‘Rubrum’ cultivar does not reseed as other Pennisetums do, making it a good variety to plant in the home garden. 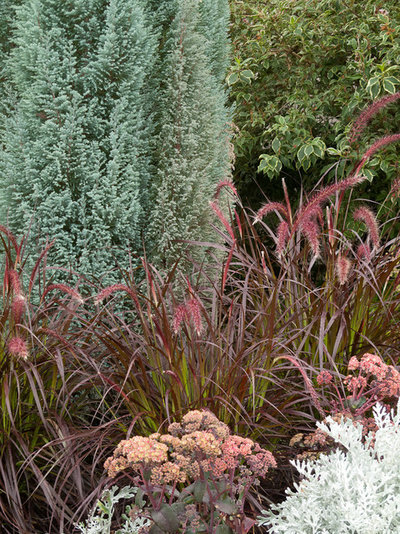 Pair it with: While purple fountain grass is often added to planting beds studded with other deeply saturated hues of red, orange and gold, it can be paired with silver and blue-green foliage to create a subtle, elegant vignette that looks particularly fresh in fall. A few silver-leaved plants to consider: Chamaecyparis lawsoniana ‘Blue Surprise’ and dusty miller (Senecio cineraria), as pictured in this combination, varieties of stonecrop (Sedum spp.) or variegated ‘Marjorie Channon’ kōhūhū (Pittosporum tenuifolium ‘Marjorie Channon’). Another fall garden favorite, coneflower is easy to grow, drought-tolerant once established and consistently in bloom from June to late August or September. Pollinators adore the blooms, which can be left to go to seed, providing a food source for birds and seeding new plants in garden beds. White and pink coneflowers surround blue oat grass(Helictotrichon sempervirens). (Anemanthele lessoniana)This cool-season grass is a medium olive green for much of the year, but come fall the wiry blades turn a brilliant orange. 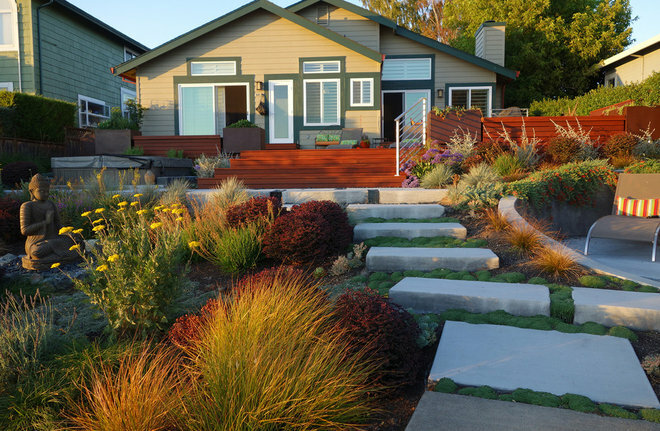 Once the color change occurs, the grass appears to burn like a fire in planting beds —particularly when backlit. New Zealand wind grass has the added benefit of being resistant to deer and tolerant of difficult growing conditions, like rocky and windy slopes. It does, however, need excellent drainage; if you have clay soil, amend heavily before planting. 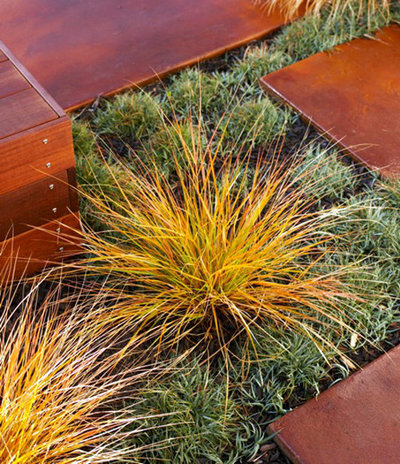 Pair it with: Given its fiery golden orange color and distinctive texture, New Zealand wind grass stands out next to most other plants. Play with subtle combinations of it and plants with gray-green and silver foliage, such as silver carpet (Dymondia margaretae), shown here, or low-growing stonecrop. 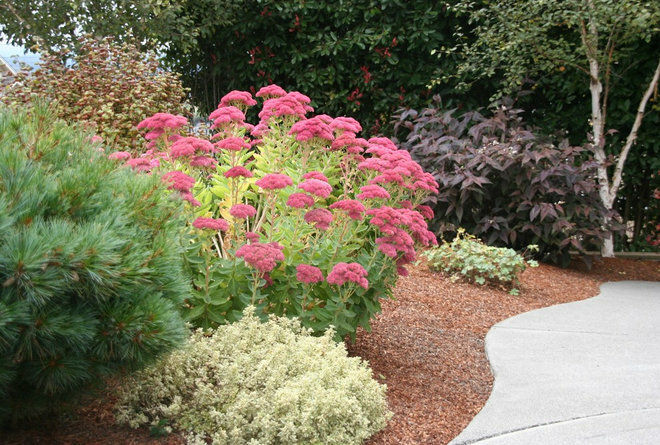 For more drama, combine it with purple-leaved plants, such as spurge (Euphorbia ‘Blackbird’) or dark purple smoke tree (Cotinus spp.). For instant results, look for semimature to mature plants at the nursery. For perennials, pick plants that look vigorous and are in bud; for ornamental grasses, choose ones that look full in their containers. As always, pay attention to the growing conditions each plant needs to thrive: Does it need full sun or partial shade? How much water? Choose the placement in your garden accordingly. Once you bring the plants home, get them in the ground as soon as you can. More mature plants run the risk of being root-bound in their nursery containers, so it’s best to carefully loosen roots before planting and to plant your choices relatively quickly. Bonus: While you may be planting now to refresh your late-summer garden, you’re actually getting a jump-start on next year’s spring garden as well. 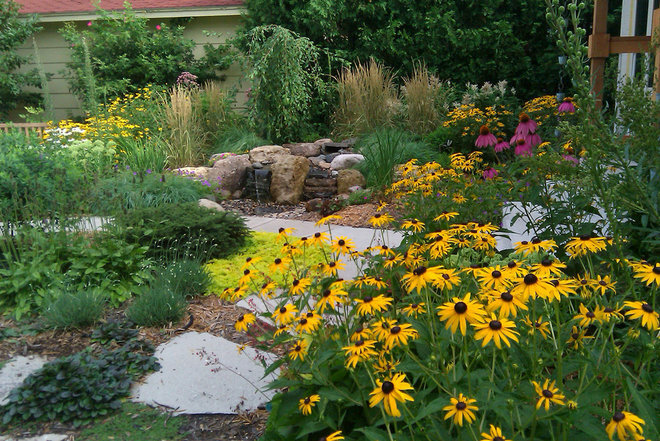 Perennials and ornamental grasses planted in fall make use of the cool winter months to establish their root systems. Come spring, they’ll be ready to burst into growth, giving your garden a head start.